That depends on your definition of a Cowboy. My name is Frank Harrell. 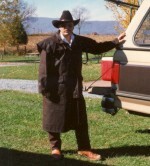 Before 2002, I described myself as a Dime Store Cowboy, it was mostly dress up. I have always liked cowboys and the outfits they wear. I also like black leather. I could wear the cowboy hat and shirts to work. I couldn't do that with full leather. About 1987 a coworker began calling me Cowboy because I wore a cowboy hat all the time. The nickname stuck and I like it. In July 2001, I met some fellows who own horses on a farm about 70 miles from where I lived at the time. 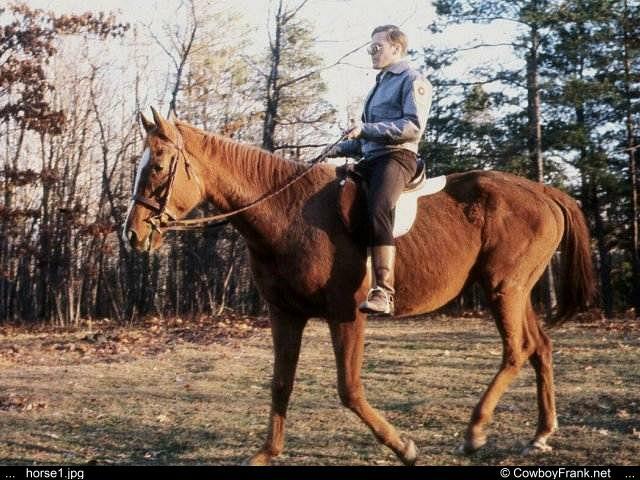 I began riding with them and later spent a year taking riding and barrel racing lessons from a top barrel racing instructor. 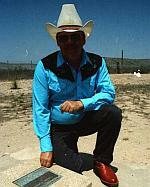 In January 2002 I became the webmaster for the Atlantic States Gay Rodeo Association. I also served as their association secretary for 6 years. In February 2005 I added The International Gay Rodeo Association to the list of websites I managed. I developed and expanded that site until 2010 when they took it away from me because I didn't think the direction they wanted to go with the site was in the best interest of IGRA or its members. Those events and others, changed my life in several ways. I was riding horses almost every week for a while and, for about 10 years was very involved in the actual production of our annual rodeo. I actually competed in barrel racing at our Washington DC rodeo one year, but lost control of my horse and didn't get a score. My partner had never wanted me to compete on a horse because he was afraid I would get hurt. Well, the first time I tried competing, I got hurt, not badly but it did put an end to any further competition on a horse. 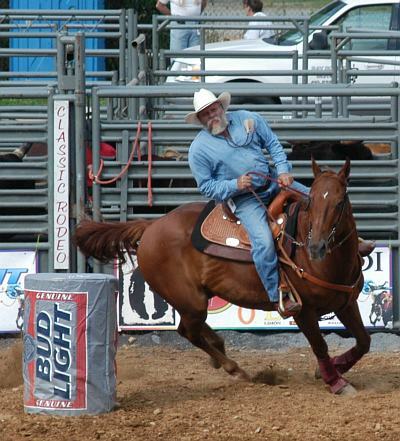 I never intended to compete in any of the rough stock events, although I enjoy watching other cowboys compete in those. After not succeeding on a horse, I competed for a few years in Calf Roping On Foot, a nice safe event. However, I have developed arthritis in my hands which made handling a rope very painful so I now work solely in the background. I now consider myself as something of a cowboy. I don't herd cattle, but I have ridden horses and still wear a cowboy hat. I have the upmost respect for the real cowboys that still ride the ranches. No the cowboy is not vanishing, he is still out there, he just can't be seen from the road. I am very proud of my current (2014) web project, the Gay Rodeo History site and encourage you to explore the 30 plus years of gay rodeo history there. I only began calling myself a bear around 2001. One of the side effects from either the AIDS or the medications, has been a drop in my natural testosterone levels. Several years ago my doctor started giving me a testosterone shot every three weeks to keep my levels where they should be. It helped reduce the breasts I was starting to grow, and as an added bonus, my beard and chest hair began growing twice as fast as ever before. I now sport a full beard, though a bit thinner than I would like, which I had always wanted but was never able grow, until now. Bear Code B6 c- - d- f g k+ q- - r+ s- t- w What's this? I was born in Rocky Mount, North Carolina in January of 1952. During my early years, I liked to play with garden hoses and extension cords. My father use to tell following story. "Frank was almost three before he was old enough to see a Christmas tree and have any real grasp of what it was. That Christmas, after the tree lights had been on for a couple of hours, I picked him up and let him grab hold of one of the bulbs. (remember the old C7 Christmas lights, the bigger hot ones) He didn't touch the tree again that year, but he has been playing with lights and wires ever since." The neighbors said I would grow up to be either a fireman or an electrician, and I've been both. In the late 1950s, my father's photographic business began to dry up and he was forced to find another source of income. He got a position in the photographic department at the Smithsonian Institution's new Museum of History and Technology (now called the Museum of American History) in Washington D.C. So at age 11, we moved to Arlington, Virginia. Here was a small boy pulled out of a small town and dumped into a teaming metropolis where I was incredibly miserable. After 2 years, we moved to a brand new house in a community just outside the Capitol Beltway in Virginia. At that time this was the edge of the civilized world. Many of the smaller roads near us, which are now four lane thoroughfares, were at that time still dirt. This new community had trees all around, and I fell in love with the outdoors. As a teenager my family took a trip to Colorado, where I got my first Cowboy Hat. There I found the beauty of the Rocky Mountains. I would really like to move there. In high school, long before I realized I was gay, I had ads of the Marlboro man pasted on the inside covers of my notebooks. I thought it was manly. The other kids thought I was weird. I guess they were right. I've had lots of different kinds of jobs throughout my life, primarily blue collar. Some warehouse work, apartment complex mechanic, electrician, plumber, store clerk, cable TV technician, theatrical technical director, and computer support person. For about 6 months in 1975, I worked at a church in Washington D.C. as an AC mechanic. One of my jobs at the church was to open the building Sunday afternoons for, of all things, the Gay Church of Washington. At this time I still didn't realize I was gay. Boy was I nervous for the first few weeks. Then one day, as I was closing up, I grabbed several copies of the Advocate (a gay newspaper) out of a trash can. By the time I had finished reading these "mine eyes had seen the cuming! ", I had finally realized that I really was gay. From about 1980 through 1988, I rode several motorcycles. To begin with I bought an old Honda CJ360 from the kid down the block. A couple of years later a young lady made a left turn in front of me, totaling the bike and breaking both my hands. I lost quite a bit of weight over the next 6 weeks by not being able to open a can of food. My right hand still has frequent swelling and pain due to arthritis caused by those broken bones. Soon afterward I bought a Honda CM200, and later a couple of '82 Honda Silver Wings. I didn't come out of the closet until 1983. Even then it was only to a few people. I met my partner Tom in that same year. He answered my ad in the Washington Blade for a roommate. He didn't really want a roommate, but we hit it off right from the beginning. In about a year we moved in together. We have been happily in love ever since. By 1987 we had vacationed in the four corners of the US. It was usually, fly there, rent a car, and drive like crazy to see as much as possible. We decided this really isn't the way to see our country, so with some forethought we bought a travel trailer and truck to pull it, (this was the first truck either of us had owned). After about a year of planning, we sold the motorcycles, the properties we owned, put the furniture in storage and took off. When asked "where will you go?" we replied, "each morning we will stick our head out the door, if it is cold, we will travel south, if it is warm we will head north." When we started, we had only one specific goal, spend at least one night in each of the 48 contiguous states. We made that goal and invented another along the way. We visited as many of the National Park Service sites as we could. In all, we spent two years on the road doing what the old hats at this call "Full Timing". We really enjoyed it and we intend to do it again. After that trip, we bought a house in Clifton, Virginia, and settled down. That fall we discovered I had AIDS, which totally changed our lives. When we realized I would live more than the six months I was given at the time, I started looking for something to do. I started by volunteering for the National Park Service's Harpers Ferry Interpretive Design Center. They produce most of the films, slide shows, museum exhibits, brochures, and many of the books you see when you visit any of the over 370 National Park Service Sites around our country. I worked for the AV department mostly dubbing videos. That was fun because I got to visit a different park, at least on video, each day I was there. Eventually the 100 mile round trip made this impractical and I applied to be a volunteer at Manassas National Battlefield Park which was only 11 miles away. There I was their computer support person, general maintenance advisor on things electrical, and was the park's first webmaster. After 6 years and over 6,000 hours of volunteer work at Manassas, I had a run in with one of my supervisors and left. Now I build and maintain web sites for non profit organizations in my area. Check my what I do page to learn more about the job I had at Manassas, and why I left them, and check my links for the other sites I manage. We lived in Clifton for 19 years, the longest I have ever spent in one place. In 2007 we traded in our old trailer and bought a much larger new 34 foot 5th wheel trailer. After a couple of years of local camping, we started off on a number of long trips, the longest in 2010 ending up lasting about 6 months. As we finished up that trip in June of 2010, and were just about 6 days from home, we looked at each other and asked the question "why are we going back to Clifton?" The answer was stupid but true. We were going back to clean the gutters and dust off the cobwebs. Right then we made up our minds to sell Clifton and move to Colorado. The house was put up for sale and as luck would have it, our real estate agent just happened to have a client looking for a house just like ours. So the house sold in 4 days, at exactly the price we were asking. We sold much furniture, gave lots of stuff to charity, put what was left into storage in Denver, and in August, 2010 we took off in our trailer expecting to travel for about 2 years before settling down in the Denver area. After a couple of months, we began to get a bit bored so decided to travel on over to the Denver area to look around and see what towns around the area we might want to end up buying in. As it was, the first house we looked at inside was perfect, and the price couldn't be beat so we bought the house we currently live in. See Where We Live for photos. We are now taking 1 or 2 trips a year lasting from a few weeks to a couple of months. We are also still involved in both our Rodeo Association back east and the association here in Colorado, as well as at the International level.